Kaagaz Ke Phool (English meaning: “Paper Flowers”, 1959) is a landmark film of legendary Indian filmmaker Guru Dutt (“Guru Dutt” was his stage name, he was born “Vasanth Kumar Shivashankar Padukone”). It is one of a set of classic films which also included Pyaasa (1957), Chaudhvin Ka Chand (1960), and Sahib Bibi Aur Ghulam (1962) that the gifted producer-director-actor made over the course of his meteoric career. Of Dutt’s great films, Kaagaz Ke Phool has come to hold a special place perhaps because of its curious embodiment of Dutt’s own tragic narrative arc. The story of the film concerns a famous film director whose downfall is precipitated by his encounter with and subsequent attachment to an unknown schoolteacher whom he fashions into a matinee idol. Although the story has mythic qualities, when the film was first released it was an unqualified financial disaster that damaged Dutt’s status as a surefire hit maker. A probable reason for the film’s failure at the box office is its lengthy presentation of personal disintegration (the entire second half of the film), culminating in an uncompromisingly unhappy ending. 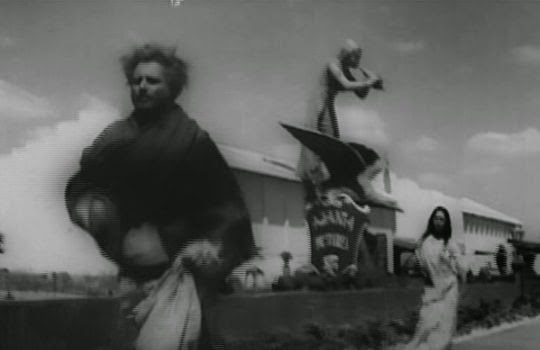 composition-in-depth long shots in widescreen (this was India’s first film in cinemascope). Unfortunately, the image quality of the film that I saw was poor and had a limited contrast range, so much of the chiaroscuro imagery in these shots was lost in dark shadows. But I still got a glimpse of the atmosphere these shots created. music-laden montages featuring rhythmically edited dissolves. narratively-embedded songs. There are seven songs in the film, several of which lift the film to a higher level. emotive closeups. These capture much of the unspoken but passionate feelings of the two principal characters. All of these Dutt-specialized techniques came to set a standard for Hindi-film cinematic expression. Nevertheless, the film has its flaws, in my opinion, too. These are perhaps partly due to the compromises that were necessarily part of Indian films of that period. Remember that television was only introduced experimentally in India in 1959 and did not achieve widespread coverage until the 1970s. So the movies were the form of popular mass-media entertainment and had to be made to appeal to the full range of societal tastes. The films of those earlier days tended to feature simplified characterizations, lots of music, and comic relief in order to hold the casual viewer’s attention. These elements could sometimes get in the way of the principal narrative themes, and this is what happens in Kaagaz Ke Phool, too. 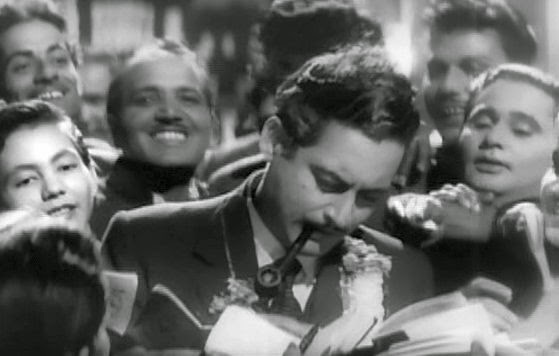 The story of Kaagaz Ke Phool begins with an old man, Suresh Sinha (played by Guru Dutt), making an off-hours visit to a Bombay film studio, where he lapses into reminiscences about his earlier days. The resulting narrative in flashback is presented in four acts. The first one of the film’s seven songs accompanies the old man’s memories of the days when he was a top film director in command of hundreds of assistants on the studio set. 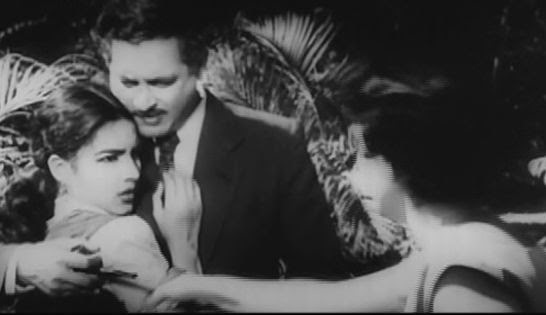 Suresh, shown in flashback in his prime, is preparing for the production of an ambitious film of Devdas, a famous Bengali novel written in 1917 about a man whose hesitancy causes him to lose his chance to marry his true love and which ultimately leads to his self-destruction in alcohol and dissolution . Suresh is looking for an actress to play the lead role of Devdas’s love, Paro, who must embody innocence and natural beauty. Later Suresh is shown traveling to Delhi to see his beloved teenage daughter, Pammi (Kumari Naaz), and we gradually learn that Suresh is separated from his wife, Veena (Veena Sapru), and that Suresh is denied even visitation rights to see his own daughter. The reason for their breakup is that Suresh’s wife, along with her snooty parents, feel that the movie industry is scandalously low class and condemn Suresh for his involvement in such a vulgar medium. His insufferable in-laws, including his eccentric brother-in-law, Rocky, and his snobbish father-in-law, Sir. B. V. Varma, are shown to be stuffy Anglophiles, and their presence in the film seems to be primarily just for comic relief. 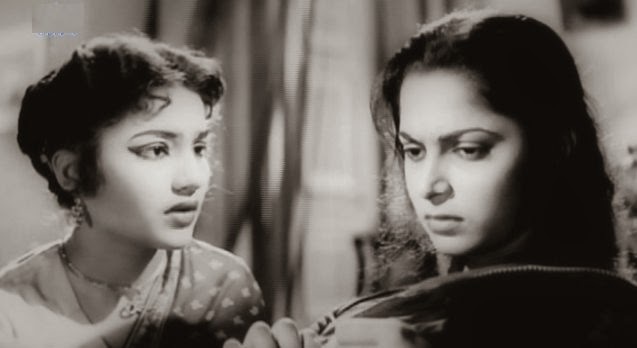 After the unsatisfactory visit with his in-laws, Suresh walks in the rain through a Delhi park and, seeing a young schoolteacher, Shanti (Waheeda Rehman), who is unprotected from the rain, he loans her his umbrella. Back at the Bombay film studio, Suresh is shooting some footage on the set. Shanti who has come to Bombay looking for work, arrives to return the umbrella and accidentally stumbles into a shoot that is then mistakenly developed and printed in the editing rushes. When Suresh sees Shanti’s footage, he realizes that her innocence and grace would make her perfect for the role of Paro. What a sweet pleasure of pain life has brought to us. As though we were never apart. We cannot see where our path will lead. You, yourself, are no more. I, myself, am no more. While the production of Devdas is ongoing, gossip columnists, without evidence or justification, start speculating about a possible on-the-set romance between Suresh and Shantti. Troubled by these reports, Pammi runs away from school and comes to visit Shanti. 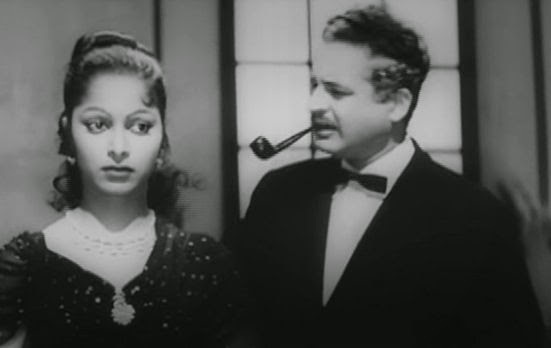 She begs Shanti not to ruin her family life (although it is evident to the viewer that the rift between Suresh and his wife is irreparable) and asks her to leave Bombay. The film Devdas is finally premiered to great acclaim, and both Suresh and Shanti are heaped with praise. But Shanti cannot share in the joy and goes to the studio producer to announce her resignation. Disturbed, Suresh accuses Pammi of interfering and goes to Shanti. He knows why she is leaving, and the two of them wordlessly accept their fate of life apart. After giving him the scarf she had been knitting for him, she departs. Suresh’s noble efforts for Pammi, however, go unrewarded. He loses to his wife and Sir Varma in a court case his attempts to have Pammi live with him. And disconsolate from parting with Shanti, he begins heavy drinking and loses his professional focus, leading to his making flops at the box office. When he is criticized and reigned in by his producers, his pride is affronted, and he walks out on them. Shantti goes back to being a schoolteacher and is shown singing a lilting little song to her students about the number system. The story now skips ahead two years and shows that Suresh has not been able to find any work and must auction off his personal belongings. Meanwhile Shanti is legally coerced by the film producers’s enforcement of her contract to return to film acting, and she returns to stardom. Shanti is now on top, and Suresh has become a penniless drunk. In an effort to rescue Suresh from his descent and see him again, Shanti goes to visit him in his slum quarters and tells him there is a deal arranged for him to be the director for her next film. But he pridefully dismisses this opportunity, telling her that he knows she has just come to him out of pity. Mindful of his ego and hoping that if she can get him to return, she can explain her true feelings later, Shanti tells him that he is nothing to her – her visit is purely professional. But this tack by Shanti doesn’t work either. Suresh tells her, “I have only one thing left in me – my pride.” Again they part. More years pass, and now Pammi is getting married. Shanti is a successful actress, but still pines miserably for her lost love. In an effort to get some money to buy Pammi a wedding gift, the down-and-out and rarely sober Suresh gets hired as a movie extra. It turns out that the movie he is to be in stars Shanti, and when he sees her on-camera (she doesn’t recognize him in his makeup beard), he is struck speechless and unable to utter the brief line assigned to him. When he removes his makeup after being summarily fired from the set, Shanti recognizes her love and chases after him out into the city streets. But she cannot catch up with him. This is accompanied by a haunting soundtrack song, “Ud Ja Ud Ja Pyase Bhanwre”, which provides a second aesthetically moving highpoint in the film and a termination of their story. The extended flashback comes to an end with the aged and enfeebled Suresh back in the empty studio, where he sits down in the portable director’s chair and dies. So Suresh had three great loves in his life: (1) Shanti, (2) his daughter, Pammi, and (3) his work as a film director. We could also add a fourth item to that list: his own pride. This story tells how circumstances and his own limitations led to his loss of all of them. I have been told that with Indian society’s vast range of material circumstances – from the extravagantly rich to the desperately poor – there is a quiet apprehension that if one drops out of the middle or upper classes, the abyss into which one might fall might be bottomless. This is what happens to Suresh. And the responsibility for his fall and his failure to connect rests mostly with his own inhibitions. 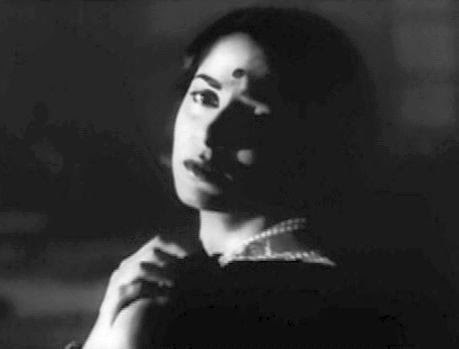 Guru Dutt expresses this tale of doomed passion and self-destruction with thoroughgoing expressionism all the way through. Almost every character other than Shanti is presented schematically in exaggeration. For example, Suresh is almost always seen holding a pipe in his hand, which presumably iconizes him as a thoughtful and reflective person. This exaggerated, expressionistic presentation works in some ways and not in others. For example the hyperbolic surroundings help make the relationship between Suresh and Shanti appear that much more subtle. 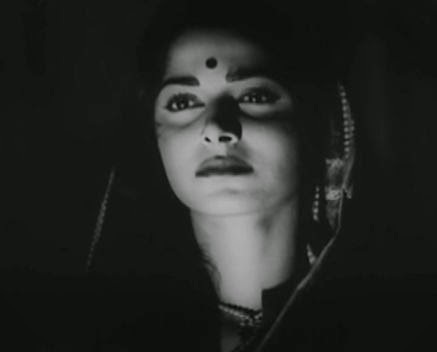 But outside the performances of Guru Dutt as Suresh and Waheeda Rehman as Shanti, the expressionistic coloring has weaknesses. 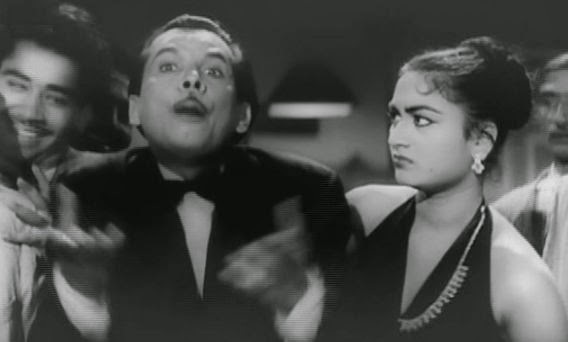 The relationship between Suresh and his wife Veena, presumably meaningful at one point in Suresh’s life, is never really shown – they do not interact at all in the film. And Veena’s parents, particularly her titled father, are shown as ludicrously pompous – the sort who believe that aping the British entitles them to an elevated social status. The biggest problem, though, is the presentation of the outrageously effeminate Rocky (Johnny Walker, born Badruddin Jamaluddin Kazi). He is shown at various points in the film irritatingly parading around like a foppish clown, which is apparently supposed to add some elements of farce to the proceedings. His activities contribute nothing to the plot progression, however, and are purely distractions from the main themes. Incidentally, Johnny Walker’s characterization of Rocky reminded me of Billy De Wolfe, an effeminate comedian of the 1940s and 50s, and I wonder if he was influenced by De Wolfe. Despite those detractions, though, the overall feeling of romantic doom remains a strong current, and the film has an epic quality that evokes memories of other classic tales. A few of them come to mind. The expressionistic presentation of a public figure’s glory and then extended decline is somewhat reminiscent of Citizen Kane (1941). In both that story and Kaagaz Ke Phool the protagonist dies unfulfilled. However, what makes Kaagaz Ke Phool a memorably compelling story is not really so much the focus on Suresh’s personal downfall; it is more the anguished expression of romantic unfulfillment. So one might think of Shakespeare’s Romeo and Juliet, where the lovers are blocked by societal divisions and conventions. But at least those star-crossed protagonists do manage to come together to express their love and have one night of rapture. Another classic of frustrated love is Gone With the Wind (1939), but, again, Rhett Butler and Scarlet O’Hara did have their moments of passion. No, in my opinion the story that most closely compares with Kaagaz Ke Phool is Wong Kar Wai’s In the Mood for Love (2000). In both that story and Kaagaz Ke Phool the lovers are paralyzed not so much by external adversaries but by their own self-imposed restraints. They stand back and helplessly watch their dreams evaporate. From a dramatic standpoint this kind of story poses problems, because the storyteller must describe a situation where not much happens – it’s what didn’t happen, and the internal turmoil associated with it, that was important. 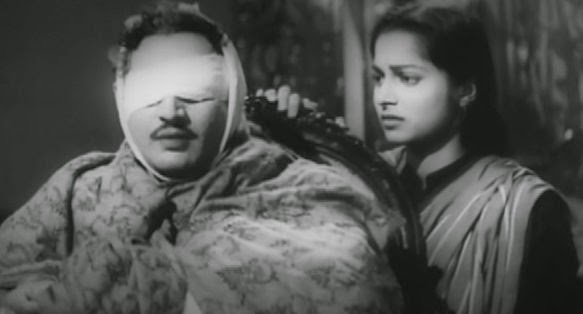 Given such dramatic limitations, Guru Dutt did well to tell the story of this nature – a story for which we all have empathy and our own similar experiences. At the inner level, there is the story of Devdas, which was the subject of the film Suresh Sinha was making in Kaagaz Ke Phool. In that story, Devdas baulks when he has the chance with Paro. Having missed his opportunity, he then turns to alcohol and ruins himself. The middle level is that of Kaagaz Ke Phool, itself, which I have related above. 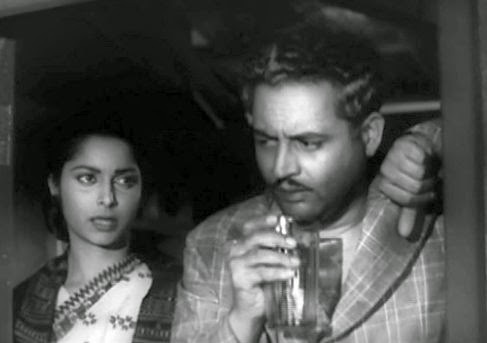 At the outer level, there are Guru Dutt’s own real-life experiences. 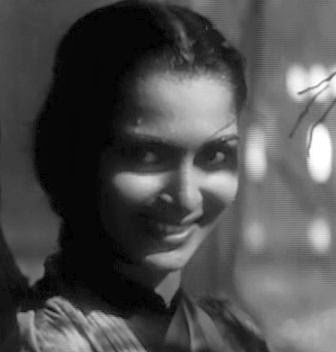 Somewhat similar to the protagonist in Kaagaz Ke Pool, Dutt’s romantic interest in his lead actress, Waheeda Rehman, led his wife, Geeta, to separate from him. But the marriage was not dissolved, and the strain eventually caused Waheeda Rehman to withdraw from Dutt’s life. Moreover, the financial failure of Kaagaz Ke Phool led Dutt, like Suresh Sinha in his film, to resign from further directing films . Although he continued to produce films, he turned to drinking and died of an overdose of sleeping pills and alcohol at the age of 39 in 1964. Indeed, film critic Murtaza Ali Khan ranked it 62nd on his 2013 worldwide list of all time greatest films at A Potpourri of Vestiges. See also Sight and Sound’s 2002 list of all-time top films, Cinemacom, 2002. The story has been filmed several times, notably Bimal Roy's Devdas (1955). There is some belief, however, that he surreptitiously directed or co-directed some subsequent films that he produced, such as Chaudhvin Ka Chand (1960), and Sahib Bibi Aur Ghulam (1962). A thorough and befitting dissection of a great cinematic essay, arguably the greatest achievement in the history of Hindi cinema. Guru Dutt was truly a pioneer and an auteur par excellence and his legacy is absolutely unparalleled as far as Indian cinema is concerned. I am going to bookmark this article for any future references. P.S. Many thanks for mentioning about my Top 100 films.